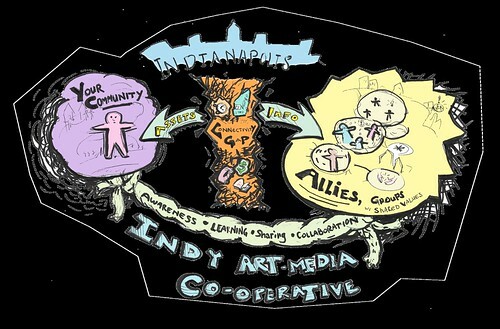 Indy Tool Lending Library (iTooLL) exists to ensure that people from all racial, social, and economic backgrounds have equal access to the tools needed to host events, create media, and share their gifts with community. UPDATE 05/05/17: iTooLL is honored to be a program of the Kheprw Institute, housed at their center in Crown Hill neighborhood. We’re past half our 2017 membership goal. We’re also excited to be co-designing a monthly series, #FilmHack—cultivating skills and connections—now during every first Thursday’s open hours. Interested to share a film-related skill or project? Drop us a line! What’s a Tool Lending Library? 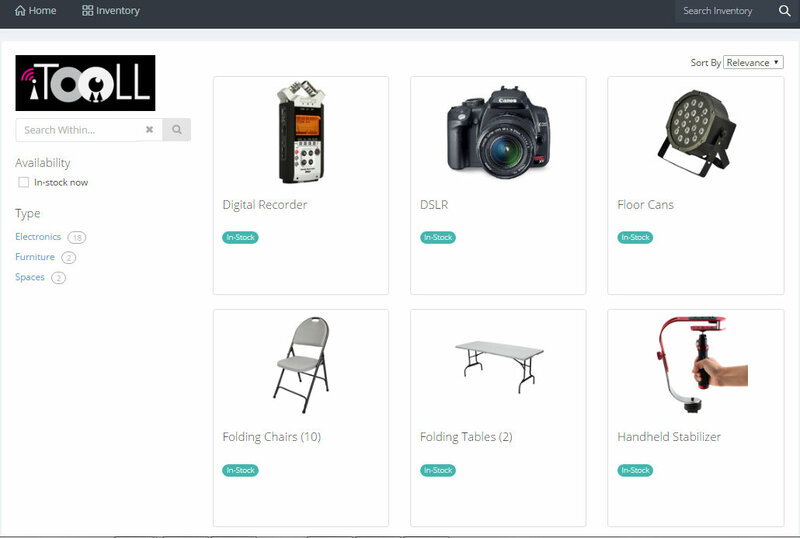 iTooLL is a membership-based tool sharing project that makes audio, visual, creative, and event production tools available for just $1/week. As a member, you are also given direct purchasing power to fill the library with the tools you need. Economic status should not determine Indianapolis art, culture, and entrepreneurship! For creatives, makers, organizers, and aspiring professionals alike, access to quality equipment can often dictate creative capacity, event effectiveness, and overall community impact. Equal access is key to amplifying diverse Indianapolis voices. OPEN: Thursdays from 6pm to 9pm and Saturdays from 12pm to 3pm. INVENTORY: Click here to see the library’s storytelling and event production tools; we have everything needed to produce a TV show or host a block party, movie screening, and more! Our catalog & checkout web-app. MEMBER RENTAL: Members can reserve tools in advance using our online app. Rentals from the library are always one-week in length and members pay $1/tool at pick-up. A fee of $5/day* will be incurred for late returns. Members buy in for the year; you can see the prices here. NON-MEMBER RENTAL: Non-Members must read the Borrowing Rules & Disclaimer in advance and must print out and sign the Non-Member Waiver upon pick-up. Tools from the library are available to non-members for 25% of the replacement cost. Non-members can only access the library during regular open hours and cannot reserve tools in advance. COOPERATIVE PURCHASING: All iTooLL members have an equal voice in our tool-buying process. 50% of your library dues are placed under your name in a cooperative budgeting platform. You will have complete say in how this money is spent to support the library. To see a sneak-peek of how this web application works, view this slideshow of the process. Remember: you, as a member, co-own iTooLL, & iTooLL, as a co-op, serves you! Sign-up online, it’s super quick. VOLUNTEER: We are passionate about connecting community members to make Indianapolis thrive. We welcome volunteers with a passion for design, A/V, outreach, writing, web development, & accounting, and are open to ideas for new projects. Email us at [email protected] to learn more about how to get involved in iTooLL and our sharing community! DONATE: Becoming a member, and donating (barely) used tools to the library are the best ways to support iTooLL! Tool donations are accepted and processed during regular open hours and can result in membership discounts. We also appreciate those who can make a one-time, monthly, or yearly monetary donation. Financial giving is tax-deductible and is accepted by in-person by check or online . As Indianapolis begins to see the potential of creatives, makers, organizers, and aspiring professionals increase through access to high-end sound, media, and tech tools, iTooLL memberships will increase. In order to secure full sustainability of this project, we only need 20 members, of which we already have six! Beyond sustainability costs, 100% of extra membership funds collected will be put back into the library and members will vote on how the money will be used to support the project (sneak peek at how we Cobudget).